Description: "The purpose of the Deco Web Design Award is to award sites for there hard work." Sites are evaluated on content, creativity, navigation, design, spelling, and coding. Citation: "Congratulations..! On A Job Well Done Your Site Has Been Reviewed And Has Been Chosen To Receive The 2003-2004 Gold Deco Award." Description: The Golden Web Award is presented by the International Association of Web Masters and Designers "to those sites whose web design, originality and content have achieved levels of excellence deserving of recognition." Citation: "Congratulations! 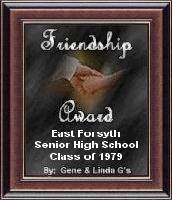 East Forsyth High School Class of 1979 has been reviewed and chosen to bear the 2003-2004 Golden Web Award." Description: International Artists and Artisans, a division of Art Space 2000, recognizes webmasters with this award. Sites are evaluated on design, creativity, and content. Citation: "Congratulations from all the staff at Art Space 2000.com. International Artists and Artisans. You have won the "Gold Metal Web Award of Excellence" for creativity, design and appearance, ease of navigation, and content. Keep up the good work." Description: Gene and Linda Gaynor, a husband and wife team from Arlington Heights, Illinois, offer a wide range of general and theme awards "to reward webmasters who have strived to offer safe, family viewing, who have complied with our criteria and who have demonstrated lots of thought and effort in doing so" and "to inspire webmasters to continue to make improvements and to keep the Internet a productive and safe environment for all." Sites are evaluated on content, design, navigation, and load time. Citation: "Congratulations! After our review of your site, we have determined that you have met or exceeded all of our award requirements. 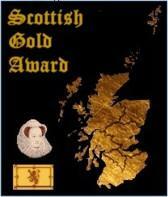 Please find attached the award that we have issued for your hard work. ... We had a very enjoyable visit and we are appreciative of your efforts to bring quality viewing to the Internet."